Are you considering a career in criminal justice? Before you decide on a verdict, it’s your duty to review all the evidence. Get the facts that can help you decide if you have what it takes to serve and protect. But the evidence inside can help you put bad guys away for life! Brought to you by StraighterLine, a leader in providing self-paced, online college courses for adult learners. 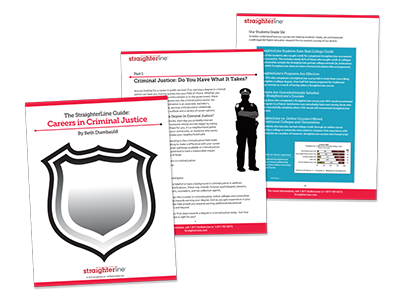 You can now download and enjoy The StraighterLine Guide: Careers in Criminal Justice.